Milk prices expected to recover as exports improve and U.S. milk production slows. Looking back at the dairy sector in the fourth quarter of 2015, international dairy commodity prices stabilized but failed to show any real signs of recovery. Demand-side conditions remained characterized by improved growth in the U.S. and the European Union. Many emerging markets, however, are showing weakness in demand, according to the Rabobank "Global Dairy Quarterly Q4 2015" report. As anticipated, the world produced more milk in the fourth quarter than the market needed, the bank said. While the stock overhang didn’t appear to worsen much, the need to clear product to less-high-paying regions of the world kept prices extremely low. Clearing this surplus in the face of weak buying from China and Russia has required pushing product into lower-paying markets, it said. “Looking forward, Rabobank expects the brakes to be applied to milk production in export regions in the first half of 2016, although this will be less dramatic and less evenly spread than we had in mind a few months ago,” according to Rabobank dairy senior analyst Kevin Bellamy. At the same time, lower pricing and some improvement in income growth will foster improved buying in deficit regions, the report notes, adding that these dynamics will lead to a gradual erosion of excess inventories as the first half of 2016 progresses, with stocks approaching normal by around midyear. “Pricing pressure will still build over our forecast period, but we delayed the timing of the recovery and envisage a somewhat weaker trajectory than we had a few months prior,” Bellamy said. Together with modest growth in consumption within export regions, this will reduce exportable surpluses of new milk by 4% in the first half of 2016 — tightening the market somewhat during this period, he added. University of Wisconsin-Madison professor emeritus Bob Cropp recently noted that depressed milk prices in major exporting countries, as well as in the U.S., likely mean that world milk production will slow in 2016, which will slowly reduce the global buildup of stocks. With lower U.S. prices and higher world prices, Cropp suggested that U.S. dairy exports should improve by the second half of the year. “With slower growth in U.S. milk production and improved exports, milk prices will show recovery,” he added. 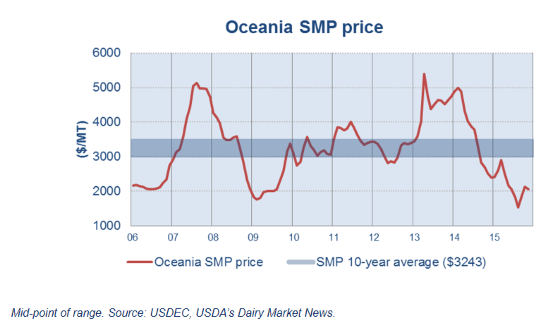 Cropp projects that the Class III milk price could well be in the $15s by the third quarter of 2016 and the $16s in the fourth quarter, with a peak in the low $17s possible. The U.S. Dairy Export Council (USDEC) said global dairy markets might not see a full recovery until 2017, given milk production trends, worldwide dairy stocks, the tepid global economy and the low profile of China and Russia on the buying side. “What we have today is most likely what we will have for 2016: a market looking for equilibrium,” Marc Beck, USDEC executive vice president of strategy and insights, said during the recent Global Dairy Outlook webinar. USDEC said markets are highly sensitive right now given the supply-side strain they are under, which is exacerbating volatility. This was evident in the August-to-September run-up in international dairy commodity prices, followed by the swift downturn in October and November. “In order to have a ‘real’ recovery, we will have to see a sustained building of prices at levels that will allow more attractive margins to return back to the farm,” Beck said. According to Beck, a real recovery means, at a minimum, a skim milk powder price of $3,000 per ton (Figure). However, something closer to $3,500 per ton would be more ideal, he noted, to support growth across the supply chain — from the farm-gate through to the consumer.